"CAAS 715 Haven St. Ann Arbor. Murals by Jon Onye Lockard, Murray N. DeVillars, Helen Haynes, and others" (detail). Lockard Murals, Box 27, Department of Afroamerican and African Studies (University of Michigan) records, Bentley Historical Library, University of Michigan. 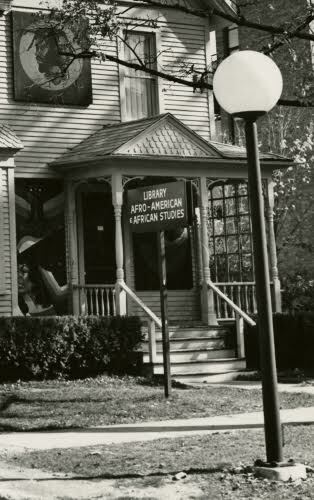 The Bentley Historical Library provides access to digital audiovisual content from the University of Michigan Department of Afroamerican and African Studies to all students, faculty, staff, and other affiliates of the University of Michigan. Recordings in the Bentley Digital media Library form part of a larger University of Michigan Department of Afroamerican and African Studies record group held by the Bentley Historical Library. For a more complete index to the materials, please consult the collection's online finding aid. For questions or more information, please contact the Bentley Historical Library's Division of Reference and Access Services.